This past Thursday marked the 36th annual Piedmont Landscape Association (PLA) Seminar in Charlottesville, Virginia, held at the Paramount Theater located on the Downtown Mall. Several members of the Windridge Team were able to attend. It is a perpetual company goal to not only keep current with popular landscaping trends, but also broaden our professional knowledge base, keeping current with industry standards & best management practices. One of the most pressing topics is the current shifting of our climate and it’s projected impact. We are busy adapting our traditional landscaping methods in an attempt to curb this change as best we can so that it may offer the plants an opportunity to adapt as well, to the best of their ability to do so. The general consensus is that we need more plant diversity, less open mulched area, and scale our dependency on irrigation way back. 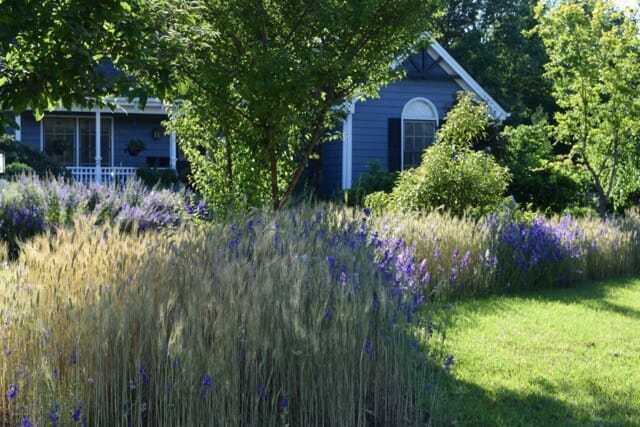 Consider a staggered hedge of mixed trees and or shrubs in lieu of that long row of identical trees or shrubs. Planting ground covers (even if they are annual vegetable plants) to cover mulched areas to suppress the weed seeds that are banked in the soil that will germinate, eliminating the need to use herbicides. Nationwide, landscape irrigation is estimated to account for nearly one-third of all residential water use, totaling nearly 9 billion gallons per day. Why then not think of reducing your lawn area to just what you use? These are all simple and effective ideas that can have tremendous environmental impacts and greatly increase your enjoyment of your yard. Whether your goal is increasing wildlife in your yard or just lessening the work time and increasing the play time, the professional staff at Windridge is here to assist you in achieving your ‘greenscape’ goals. Here are some cool links to a few of the topics (and professionals leading this charge) in the Green Industry mentioned above.